It seems that every conversation I have with my son nowadays include battle royales, the legendary scar, tilted towers or shooting John Wick first thing in the morning. 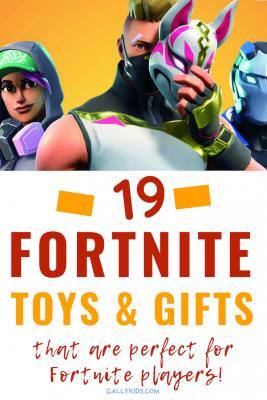 Anyway, if you’re thinking of getting that perfect birthday or Christmas present, here are some ideas of the best Fornite toys and gifts that kids and adults would love to get. There aren’t that many Fornite toys right now. Since it’s a new game, it’s taken a while for toy companies to keep up with the popularity. So far, Epic Games has agreement with toy companies like Hasbro toys, Macfarlane Toys and Moose Toys, but I don’t think these toys are going to be ready for the 2019 Christmas season. 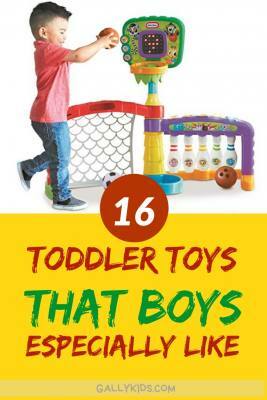 At any rate, there are already a few toys that are available. Here are some of the ones that have good reviews. Yes. that’s right. Monopoly has come up with it’s own fortnite themed game. How cool is that? 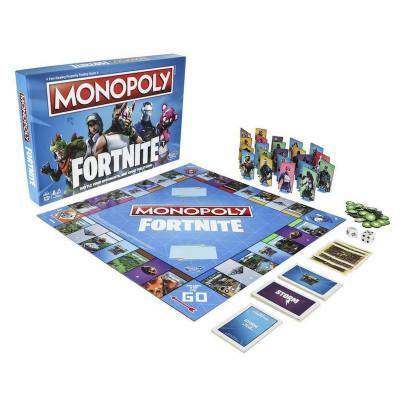 It runs along the concept of a Monopoly game but with Fortnite themes. If you’re looking for a way to get your kids off the screen for a bit and enjoy a game with family and friends, this is the way to go! 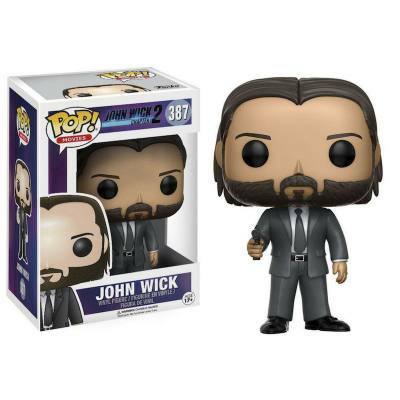 Funko Pop is always fast at coming up with figures for any popular game. And when it comes to Fortnite figures, they already have a few on board. Some of these figures are not yet available and you will have to preorder them if you want one for a Christmas present. See all the available Fortnite Funko Pop figures here. 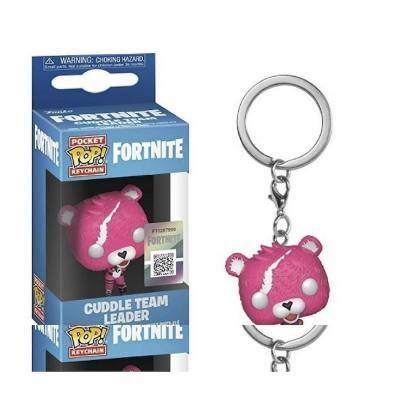 Funko pop also have some Fortnite keychain merchandise. I’m sure there’ll be more figures in the near future. But right now, some of the ones you can get include key chains with the Cuddle Team Leader and the Love Ranger figures. With Christmas coming, it’s now the time of year to wear ugly Christmas shirts. But a kid gamer doesn’t have to live with that! :-). 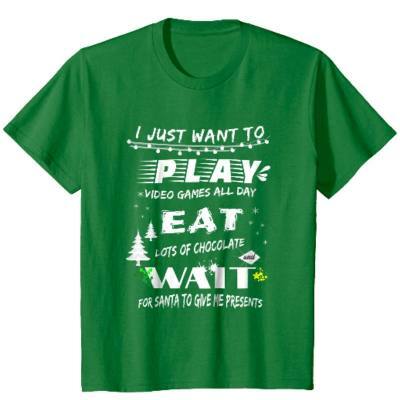 Instead, he might just want to wear this Christmas gamer’s t-shirt that says his sentiments. Click Here to check it out! It’s on Sale today, too! 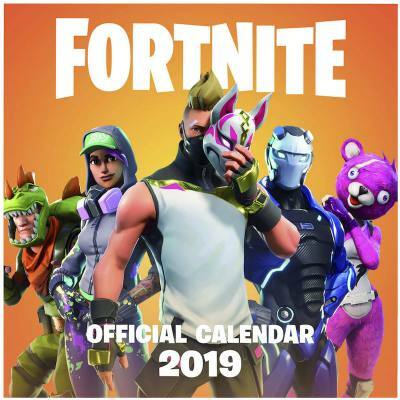 Epic Games has released the official Fortnite 2019 calendar. Each month of the year has the image of a Fortnite skin on one side and the dates for the month on the other. The skins include TomatoHead for August, Bunny Brawler for April, Jonesy for May and many more. Here’s another official Epic Games merchandise. There are a few designs of these pocket notebooks. 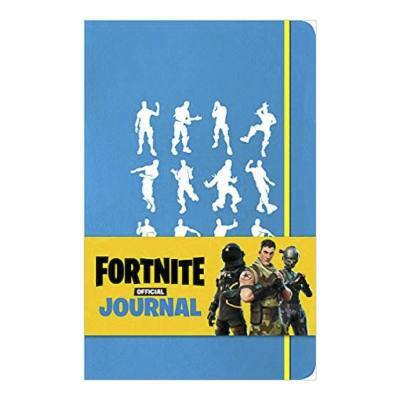 The cover of each journal has a Fortnite theme — so there are images of the Loot Llama, Fortnite dances and other skins. Click here to see all the cover designs available. From birthday cake toppers to keychains, the pink and purple loot Llama is one of the more popular Fornite figures that kids love. This Loot Llama gift pack includes a 10-inch soft plush llama toy, 2 keychains and 40 pack stickers. 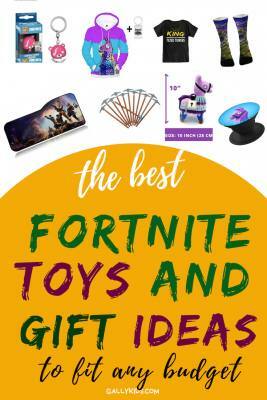 It’s a great gift idea for the child who wants to collect some Fortnite toys as well as have Fortnite stickers to use and a keychain to show off to friends! 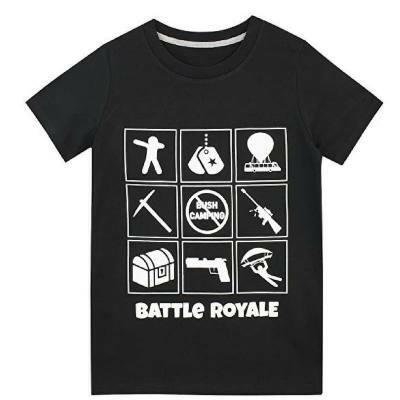 Fortunately, there are more ideas for Fortnite gifts that are non-toy items. If you’re thinking about buying a Fortnite merchandise for Christmas or a birthday present, then you can widen your search for that perfect Fortnite gift by looking at clothing, books, bedroom decor or some gaming gadgets. From what I can see, one of the popular t-shirts is the one that says, “Floss like a boss”. I guess this has something to do with the popularity of the dance among kids. Or the funny and simple “I Paused My Game to be Here” shirt! Get your child off his console with a Fortnite book for kids. There are surprisingly many Fiction and Non-fiction Fortnite books. So if you miss seeing your little boy huddled in a corner reading a book, you’ll see that rarity again when you buy him one of these Fortnite books. 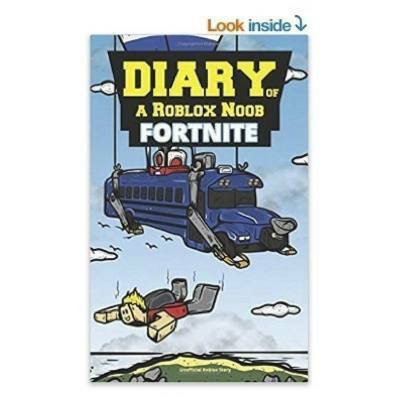 The Diary of a Roblox Noob:Fortnite, is the current bestseller when it comes to Fortnite books for kids. It’s a fun book for kids to read with an interesting premise that many gamer children would enjoy reading. In this story, a Roblox player suddenly finds himself in the Fortnite world — and you can only imagine the craziness that ensues afterwards. Kids love this book. Just read the many kids who are are giving their 5-star reviews on this book. 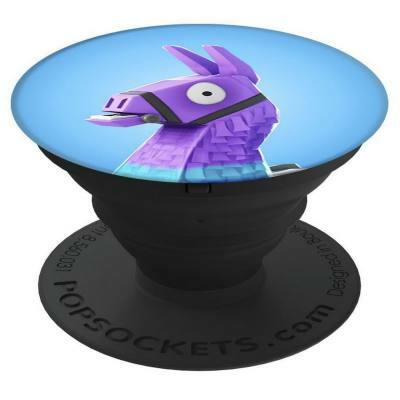 This is a Fornite-themed popsocket: A device that makes holding and propping up a smart phone or tablet easier. This one has a Loot llama image on it, is made of durable material and sticks well to the device. 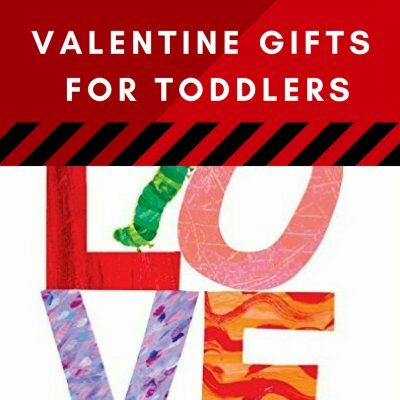 This makes for a good gift idea for both adults and kids. If you don’t know what a pop socket is, it’s a little accessory that you can attach to the back of a phone, that makes it easy to grip and handle. You can easily tilt or prop a phone when you have one of these as well as take selfies or videos. Spirit Halloween has come up with this light up Boogie Bomb with Sounds which makes for a great costume accessory. This is a fun little toy to have. 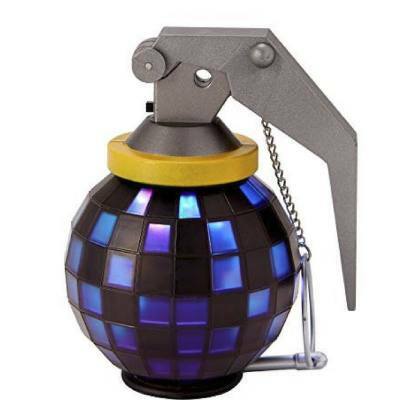 The Boogie bomb plays music and then lights up much like in the game. 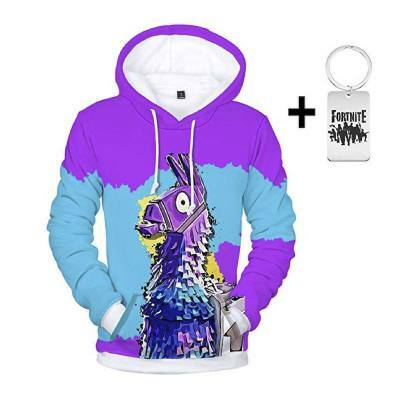 This colorful unisex Llama hoodie has sizes for both young kids, tweens, teenagers and adults. Whether you want this hoodie for an 8 year old or a teenager boy, there’s the perfect size for it. Read the FAQ as well as the reviews to know which size to buy. From what I can see, to find the perfect size, you need to measure the chest and height (for the hoodie) and then use the size guide on the page. Looking for that perfect stocking stuffer for your boy? 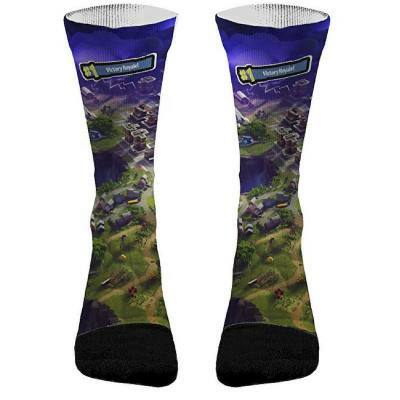 Check out the socks with a Fortnite theme. The colorful Loot llama and other loud prints should sit well with the kids and the young at heart. But there are also other socks that are a bit more “tame”. I especially like the very subtle sock print that says “Please do not Disturb. 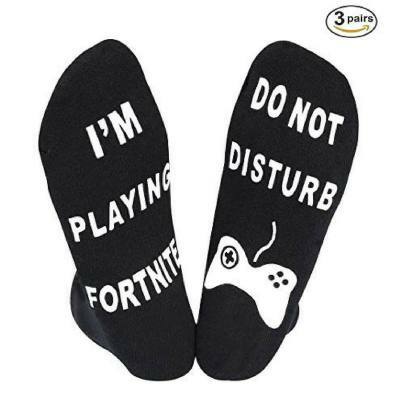 I’m Playing fortnite” on the sole of the socks. Here are Fortnite compression socks with sizes for kids and adults. The socks go up to mid-calf. What many Fortnite loving boys would love to take to school! Ha! 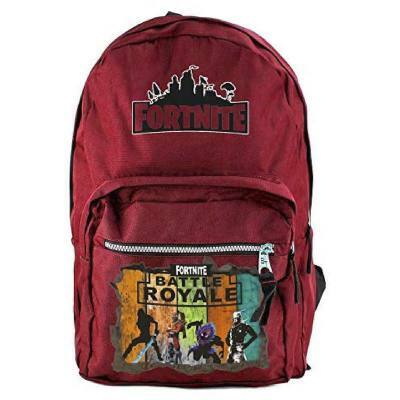 There are many school backpacks with different Fortnite designs on it. You can choose a simple black backpack with the words Fortnite written on it or the more colorful prints. The Loot llama print is once again a popular choice. I like this red Fortnite backpack on the right. 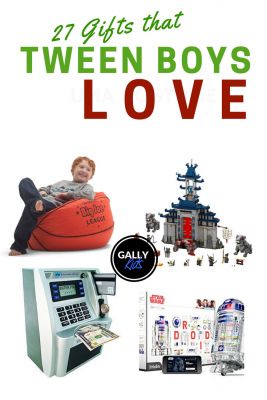 These toys and gifts are not Fortnite merchandise. 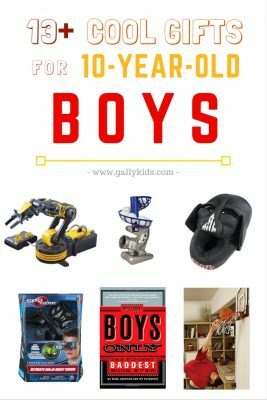 But judging from the current “gaming” interest of my son who plays Fortnite a bit too much, these Gaming items are in the list of things he would be happy to get. A simple present but one that is special for a gamer. 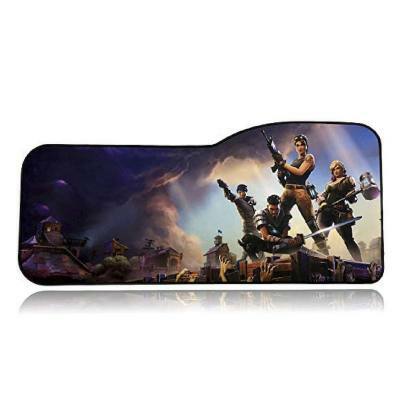 This professional gaming mouse pad has the fortnite image on it. It has anti slip rubber base and stitched edges for extra durability. It’s also pretty big and has a lot of room for both the keyboard and the mouse. I especially like that the area for the mouse which is a little bit higher and curved than the rest of the pad. This makes some extra space for the mouse to move around. However, if this is a feature that you are not particularly a fan of, there are other shapes too. This is a highly rated item and reviews especially comment on the quality and durability of the pad. You know how gamers hate being disturbed in the middle of a game? 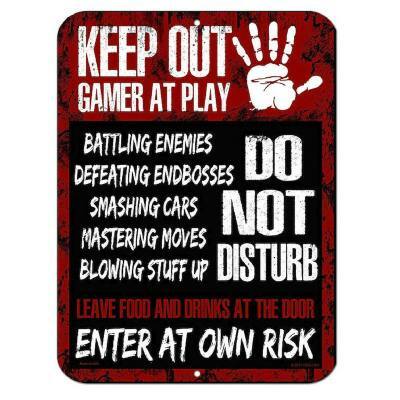 Keep Out Gamer At Play. Battling enemies. Defeating endbosses. Smashing cars. Mastering moves. Blowing stuff up. Do not Disturb. Leave food and drinks at door. Enter at own risk! This poster is 8 x 12 inches. It is made of thin metal and is light enough to hang on a bedroom door. 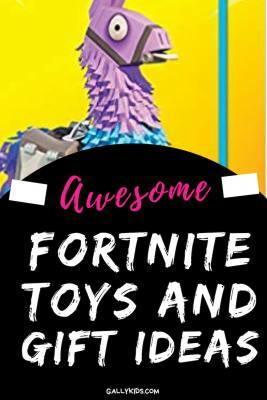 If you’re looking for Fortnite party supplies and favors, here are some of the cool ones that I’ve found. 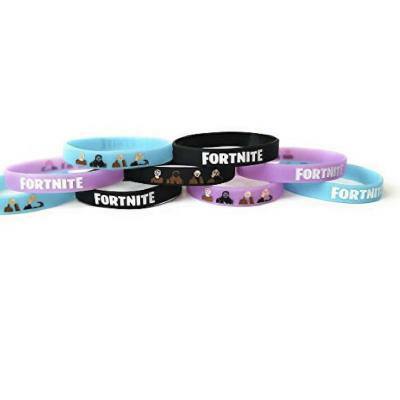 Every one of the guest in your party is going to love these Fortnite bracelets. This is a perfect item to add into the party bag for kids to take home (and no doubt wear!). There are nine different bracelets in this set with pink, blue and black colors. They’re glow in the dark too and are silicone-safe and non-toxic. Expect your sons’ or daughter’s friends to use these Fortnite pencils in school after the party. This is a unique item to add as a party favor. 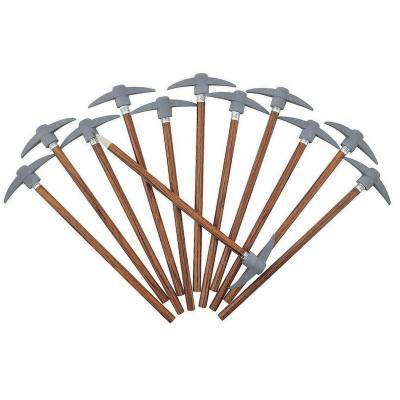 These are pencils with pickaxe for a topper. It’s not an official merchandise but it looks similar to the Fortnite pickaxe. And with your Forrite theme party going on, the kids will immediately know what this is all about. There are 12 pencils in this set and have a no. 2 lead. Haven’t I mentioned that the Loot Llama is one of the popular figures in the Fortnite world for kids. 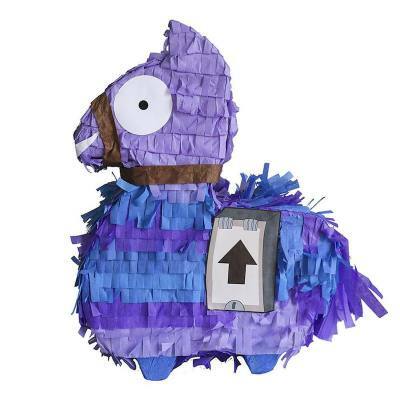 Well, a fortnite party is not enough without a Llama Pinata like this one, don’t you think? Remember, you’re only buying the pinata here. You will need to separately buy the toys and sweets if you’re using this for a birthday party. The llama measures 17 x 13 x 6 inches and can hold up to 2 pounds worth of items.